Small, but packing a punch! Suzuki continues its decades-long tradition of building compact off-roaders with the new Suzuki Jimny. To give the three-door car even more striking off-road looks, Cobra Technology & Lifestyle offers a tailor-made range of accessories. The spectrum ranges from stainless-steel components with matte black coating or shiny chrome finish such as two different energy-absorbing brush guards and rocker panel guards in various variants to aluminum running boards and auxiliary headlamps. All Cobra Technology & Lifestyle components are manufactured in OEM quality and come with a 24-month warranty with unlimited miles. In line with the current trend, all Cobra Technology & Lifestyle stainless-steel elements for the 2018 Jimny are not only available with a chromed stainless finish, but also in matte black plastic-coated variants, which also allow painting them in vehicle or contrasting color. 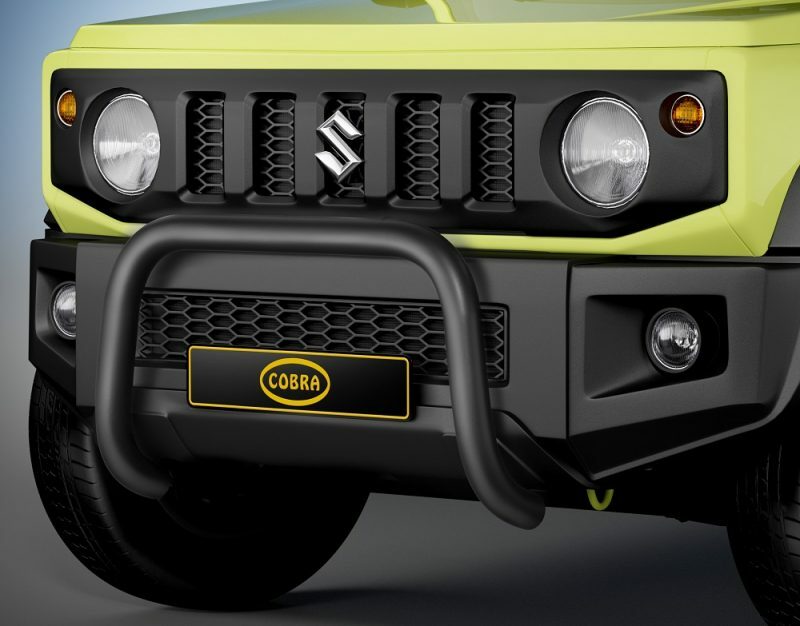 The Cobra Technology & Lifestyle designers and technicians developed two different brush guards to give the small off-roader an even more striking face. The base version with a tube diameter of 60 millimeters already lends the front full-blooded off-road looks. To emphasize these looks even further, Cobra Technology & Lifestyle also offers an even more elaborate variant with an additional crossbar measuring 42 millimeters in diameter. It offers additional protection for the bodywork. However, the two guards do more than just lend the Suzuki more thrilling looks. Both protective elements were designed to be mounted elastically and to give in a collision. As a result, the two accessories comply with the stringent EU Directive 2009/78 on pedestrian protection. After successfully passing the mandatory crash test, the Cobra Technology & Lifestyle brush guards were granted an EC type approval. This saves Jimny owners time and money by eliminating the need for a safety inspection and subsequent amendment of the vehicle documents. To optimize the active safety further, Cobra Technology & Lifestyle offers auxiliary headlamps that use special brackets to attach to the main bar or alternatively to the crossbar in case of the top-end version of the brush guard. Matching the front upgrade, Cobra Technology & Lifestyle enhances the small off-road speedster with rocker panel guards with a tube diameter of 60 millimeters, likewise available with a choice of chromed or matte black finish. Thanks to the integrated step on both sides, getting in and out is easier and safer. What is more: The robust components, which come in a ready-to-install kit for both vehicle sides, also protect the rocker panels – especially when driving in terrain. The two versions of the Cobra Technology & Lifestyle stainless-steel running boards with corrugated aluminum surfaces also offer a choice of matte black or chromed finish and likewise provide sure footing. Alternatively, there are also Cobra Technology & Lifestyle rocker panel guards that hug the lower sections of the vehicle sides and as a result can protect against damage as well. 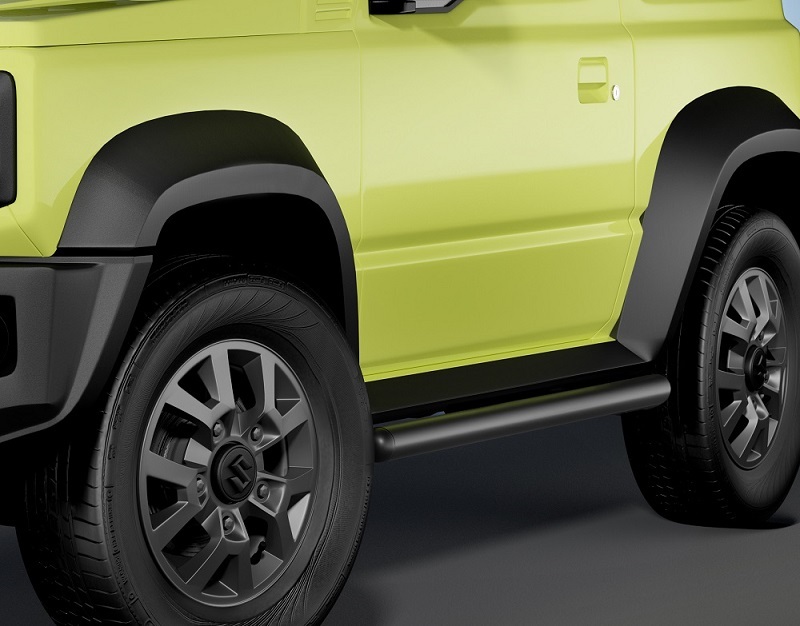 The third option for upgrading the side view of the Suzuki off-roader visually and facilitating getting and out of the vehicle are Cobra Technology & Lifestyle aluminum running boards. The high quality of all Cobra Technology & Lifestyle components is evidenced by the 24-month limited warranty with unlimited miles.